It’s an exciting day for SideQuest Studios and the eastasiasoft team! 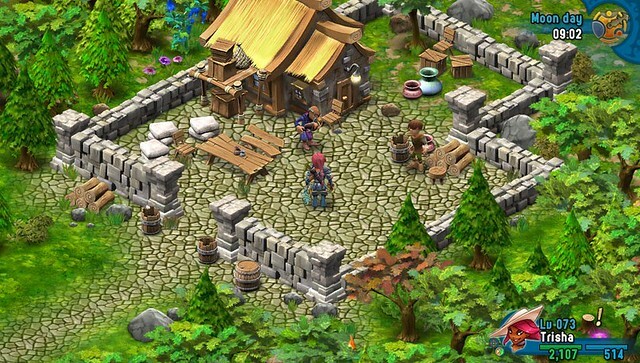 Our indie role-playing game, Rainbow Moon, is out today for PS Vita. And as promised in my last post, we have a lot of great offers for PS3 Rainbow Moon players and PlayStation Plus subscribers. 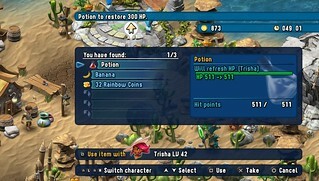 Firstly, for new players, we have a trial version of Rainbow Moon that gives you access to the full game for 90 minutes. The trial can be replayed as often as you like and any progress that you make is carried over when you purchase the full game for $14.99. The latest version of Rainbow Moon adds more than 30 bug fixes, improvements, and new features to the original, including cross save support. Now you can now import old saves and share any new progress between both platforms. For those of you who already own Rainbow Moon, for a limited time you can take advantage of our PS3 player offer and grab Rainbow Moon on Vita at a 50% discount. PlayStation Plus subscribers can also save 20% during the first two weeks of launch, meaning you can pick up Rainbow Moon for as little as $5.99! Finally, all Rainbow Moon add-ons support cross buy functionality, so any Rainbow Moon DLC purchased will automatically be applied to both systems. Once again, thanks a lot to all our valued fans that have supported us during the last few years. I hope that you have as much fun playing Rainbow Moon as we had developing it. Please share your feedback and questions in the comments, and don’t forget to look out for Rainbow Skies, which will hit PS3 and PS Vita in the future. Ready to sink another 100 hours of my life into this! Nice to see a Vita demo for this. I will definitely give it a try. Cross Buy for the whole game would have been great, but I understand that it’s not always going to be possible. This is the next best thing, and I’ll be picking it up for my Vita today. Crossbuy for DLC is an unexpected bonus. I think I’ll get a lot more time to play this version. Thank you for supporting Vita gaming! Had been waiting for this to come to Vita before I bought it…..Now that Y’s: Memories of Celceta is finally out (after many delays) I’m smack dab in the middle of the that. Will be getting Rainbow Moon soon though. Thanks for getting it to the Vita. The PS Vita support is more man welcomed… I’ll gladly check out the demo!!! Thank you guys for all the positive feedback! Hope you’ll have as much fun as we had on testing. The PS Vita support is more than welcomed… I’ll gladly check out the demo!!! Really stupid question here, but if I purchase the PS3 version today, as a PS Plus member, would I qualify for both the PS3 and PS Plus discounts for the Vita version (as detailed above), or does the PS3 Owner’s discount only apply to purchases made before today? Any assistance provided would be greatly appreciated. Good question, I think yes, but I’ll check with EAS and get back to you. Just as a follow up: The PS3 Player discount qualifies for purchases made in the past and present. If you download Rainbow Moon for PS3 now, you can get the Vita game at a 50% discount. Alternatively, you can purchase the Cross-Save Bundle, which contains both versions and costs the same price. After I’ve Platinumed Tearaway, think I’m gonna give this a try. I remember when it came out on ps3 and thought it looked like nostalgic fun. Man…Tearaway is awesome. Just wanted to say a big THANK YOU for putting out a demo/trial. I really wish more devs/pubs would do so and/or Sony would make it a requirement for this generation. I do not own a PS3, so this will be my first chance to play RM. Yeaah, can’t wait to dive in this game :D! Thanks for the Vita port :D! thanks for the PS+ discount and for a fantastic Vita game! The Vita Lounge gave this game 4.5 stars out of 5 and that guy hated the PS3 version. I’m so glad you are giving people like me who bought the original ps3 version a discount. I’m curious, are there seperate trophies or the shared with ps3 version? we felt we owe our fans and all the people who have supported us at least a discount. Trophy set is the same one and synced with the PS3 version. That’s because of the cross save feature. Really glad this is finally coming to Vita – +1 buy here! i would like to see discounts on the ps3 version for those who not bought it yet or maybe a ultimate bundle which adds the vita version with the ps3 premium bundle. Give to us news about Rainbow Skies! Guess I’ll have to wait till Rainbow Skies to get some new trophies. I thought I read earlier in the year that it would have a separate list, which was kind of a motivating factor to play it again. But I guess cross-save is a more important feature than more trophies. In that case it’s indeed hard to make everyone happy. We have thought about a new trophy set but it was a strong recommendation from Sony to use the same one if we support cross save and I think that’s what most people want. That’s of course no help for people who hoped for new trophies. I’m sorry for not having a more positive reply; Thanks for your feedback though. Rainbow Moon is tons of fun, and I highly recommend it to anyone who hasn’t played it yet. Thanks again for making this fun game! What time will the game appear in the store? I’m new in the PS ecosystem. I had already decided I wasn’t getting this again when I saw the 14.99 price….but since you are giving us a discount for having purchased it already, I’m all in! I stopped playing RM when I heard you were making a Vita version. This is how I wanted to play it! Rainbow Moon will be available in the Brazilian PS Store too? I own this on PS3, but didn’t have the time to play it, but I will definitely be double dipping on the Vita version, and taking advantage of the Plus discount as well! Thanks for supporting the Vita! Looking forward to Rainbow Skies as well! Waiting for PS Store to open. Rainbow Moon and new Ys game are my Vita games for the winter season. Yay, thanks for the Vita support. The Vita is perfect for RPGs so the more, the merrier! I really shouldn’t be spending any money…. but…. you guys have worked hard to earn it, and have made it quite hard for me to argue otherwise with the PS3 Player Purchase Price. Well played, and take my money!!! I have been waiting for this to hit the Vita. Don’t have a ton of time to put into it on my PS3 but now I can sink my teeth into it on the move. Awesome! Now if the PS Store would update I would get the download rolling. Thanks for the reply. I understand the position you guys were under, and cross save is definitely a better selling point than a separate trophy list. I will still be buying Rainbow Moon Vita, and any DLC bonus items/coins you guys offer, because I truly believe your company is offering a great value for such an insanely low price. I spend thousands of dollars on gaming every year, and Rainbow Moon is certainly up there when it comes to fun vs value, which I honestly can’t say for a lot of games that start out at $60. Thank you to your team, and I’m definitely looking forward to Rainbow Skies, in all its forms! Cheers! I was on the fence about rebuying this game (good game) but with the discount for PS3 owners it’s now a no brainer to get it, thanks. Please put Rainbow Skies on PS4! I had this game for the PS3 it was easy to pickup old school cartoonish but colorful & incredible art style and had a good amount of strategy to the battle mechanics. great game to check out if you’re looking for that old school RPG fix. It’s like 8bit Final Fantasy with a touch of A Link to the Past with polished visuals. Excellent game perfect for on the go pick up & play or hours of commuting & road trips. Awesome deal for previous owners of the game. Definitely picking this up today. Can’t wait for Rainbow Skies! Does it stil have those micro-transactions? And will Rainbow Skies also have them? yes, there is some DLC available for Rainbow Moon to speed up the game. I’m aware that on many discussion boards some people state that this DLC is required to be able to complete the game. Please let me clarify that this is not true! The whole game has been balanced without any DLC! In fact we’ve added the DLC feature *after* the game has been completed for people who want to rush through or just speed up the game. If you play on normal difficulty mode, you’re good if you defeat most of the visible monsters on the maps. No extra random battles are required and no DLC is required, so in my opinion this is far away from grinding. However the focus of the game are battles, so if you want to skip most of the battles, you’ll get into trouble sooner or later. But there is no dungeon or map that is locked because of DLC and you can get all the strongest weapons and items without buying any DLC. Again, it’s complete optional. Rainbow Moon is by no means a F2P game! 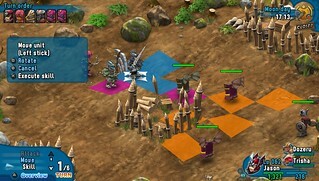 For RainbowSkies we will present a different DLC model. But again, all DLCs in Rainbow Skies will also be 100% optional and not required to complete the game. I’m starting to love my Vita!!! Downloading it! And the first one to rate 5star in ps vita store oh baby, been waiting all day trying to refresh my ps store to update… Wew! Thanks men! The “Rainbow Moon PS3™ Player Special Offer” which looks like the 50% off does not show up in the Plus listings, only the $15 game. That means we can’t apply the Plus discount along along with the 50%, unless I’m misunderstanding. It might just be that Plus isn’t updated yet. Just mentioning it. Disregard previous post, it changed from $7.49 to $5.99 when I added it to my cart. Kinda weird, but it’s working as intended. Thanks a million for bringing this lovely game onto the PSVia as promised. And as promised, I made use of the lovely discount (bough the PS3 version once the PSVita version was announced) and bought the PSVita version as well. It’s really that easy, bring more games onto the PSVita and its owners will buy it. But please take your time doing so and make sure that they are either proper ports or new experiences (like Tearaway). @41 I was going to mention that, the cart will update the value. Just make sure that you check this value for ‘free’ PS+ games and make sure that you see the discount before checkout. Normally, just remove the game from the cart and re-add, that would fix it. Are these improvements updated into the PS3 version as well? I’m abut 60 hours in, just started what I believe to be the last dungeon. Then of course there’s all the monsters to beat to death after that. Also really looking forward to Rainbow Skies. I hope it itll comes out on PS3, my PS4 purchase is years away yet. If you want to port it to Wii U that’d b great too. yes, there’s a patch available for the PS3 version, so PS3 owner get all the updates and improvements for free. @44 – There was a patch to PS3 Rainbow Moon about a week ago, so I’m guessing that they are. Especially since the game is cross-save compatible. The PS3 Owner Discount is much appreciated. I will be purchasing the Vita version today. Thanks! Amazing deal. First ever day 1 Vita purchase for me. Downloading now. Big thanks. Ps plus has a bundle for $17.99, what a steal!!!! I really do love my PS Vita. I’m going to go download this Rainbow Moon ASAP! Furthermore, I’m really excited about seeing more of the sequel Rainbow Skies. RPG’s are the perfect fit for the PS Vita.